I've had two gigantic canvas's sitting in my art room waiting for me to get creative. I may have to keep this one (I think I've said this before). Then again if I got a good enough offer, who knows! I'll sell anything that's not nailed down. That's why I don't have very much of my own artwork. Do you think it's too big for this area? This gal has my posture after sitting at my drafting table all day. I saw this stance on a lady from a vintage sewing pattern. On the pattern the ladies apron was sheer so you could tell she was slim and trim even though her transparent apron flared out over her straight black skirt. My mother thinks she looks "in the family way". So, I could have put "Hot from the Oven", but didn't want anyone to get the wrong idea. I thought it would be nicer to use "Sweet and Irresistible". Do you think she needs a tea towel over her arm or a pearl bracelet? Every woman in the 50's dressed up to bake didn't they? A towel might take away too much from her cute apron though. Let me know what your ideas are. This is kind of like having the lady from that movie "the 50 foot woman" above my stove. Hope she doesn't kick those cups off! Don't forget to sign up for my Valentine's Day giveaway in my previous post. I love this Cathie and I like where you have it! Wonderful! It is perfect just the way mit is. It looks like a vintage- advertising. 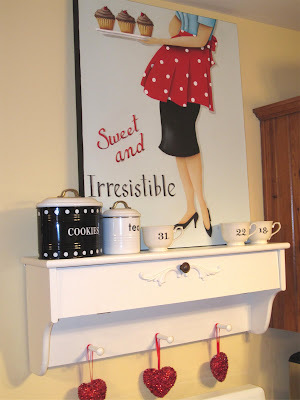 The red polka dot apron is my favorite ! Cathie-what a wonderful painting! 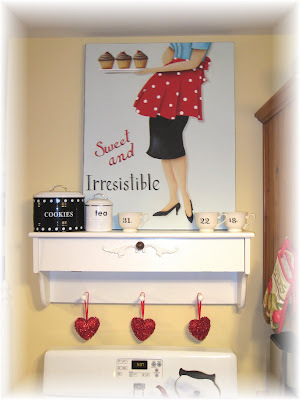 I love it above your stove with your white shelf-just wonderful! What an extremely talented lady you are!! Enjoy! This is my favorite painting so far!!! I love this!!!! It is so super cute!! I do think you need to keep this one, and I agree with your mom, she does look in the "family way". I just think back then, and maybe we've progressed, it was a nice way of saying. I love the idea of a bracelet. I can remember visiting someone once, can't remember who, but she was dressed much like this, and lipstick and the whole bit, baking. She never wore slippers in the house, those were for the bedroom, it was shoes. Like June Clever. Beautiful. I LOVE it! It's perfect!!! Eeeeek!!! Oh my goodness. I love it! I might have to commission you to paint me something special for our kitchen. Keep it mom!!!! Don't sell it unless they offer you a lot of dough!! He he. Love ya! Catherine, I love her, I would never part with her either...just perfect in that spot too. I personally do not think she looks pregnant...She is gorgeous. I love her just the way she is and she does look wonderful right there. Watch out or some bakery is going to come along and want her. I love her!! I really like all things vintage-y. She looks fanastic on your shelf too! That picture is adorable! I love the colors and composition! I can see why you'd have a hard time parting with it! I LOVE her!!!!! I think she looks great as is. If you add anything more I'd suggest only a bracelet (even a charm bracelet would be appropriate). I just love her and can see why you're contemplating keeping her. A charm bracelet with a cupcake! Love your work! I just found you on ebay. Very nice! It's a great painting, Catherine! I think a pink pearl bracelet would be fabulous. Oh wow. You should definitely keep that. That is amazing. I love it. Maybe you could make prints of this beautiful painting and you would be able to sell it in ebay. I would buy it immediately.